Old jeans get transformed to make a hip bum bag. 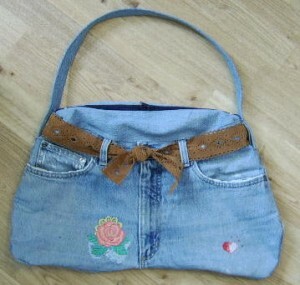 Any size jeans can be used depending on the desired size of the finished bag. Embellishment has unlimited possibilities to mend or to just dress up old denim. * One pair of old jeans – clean with holes is fine. * Embroidery or appliqués of choice. * A 90/14 or stronger sewing machine needle is strongly recommended to sew through the many denim layers. Note: The bag shown in this tutorial were a 32″ waist with a 30″ inseam. The directions leave adjustment room but large variances may require more than allowed for in the directions.